Liberty’s Carson Kharchla celebrates after winning a state title at 170 during the OHSAA Division I Individual State Wrestling Tournament Saturday at OSU. 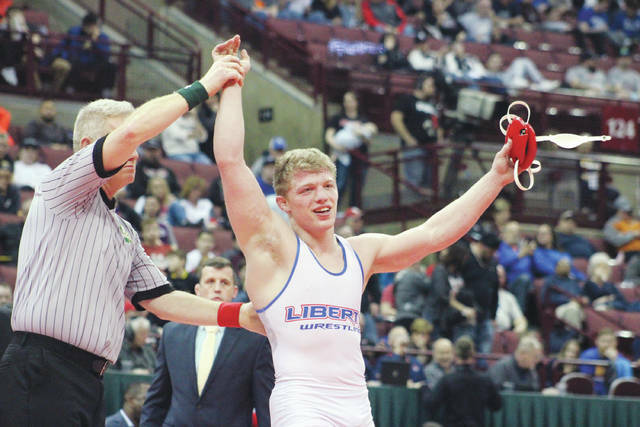 Olentangy Liberty junior Carson Kharchla knew exactly how his championship match was going to go Saturday night in the OHSAA Division I Individual State Wrestling Tournament at OSU. “My game plan is always the same: wrestle to win,” he said. “I look at it like this: you already know the outcome of the match … you’re either going to win or you’re going to lose. Kharchla didn’t have to worry about that. The junior, competing in his first state tournament, scored more than enough to get the job done. He knocked off Medina senior Brady Chrisman 12-3 to cruise to the top of the podium at 170 pounds. Kharchla finished the year with a 38-2 record — a mark including a pair of wins over Massillon Perry senior Emil Soehnlen, the defending Division I state champ at 170. He beat Soehnlen 7-2 in Friday’s championship semifinal to set up Saturday’s showdown with Chrisman. His other two tournament wins came against Massillon Jackson’s Tyler Tolarchyk and Cincinnati Archbishop Moeller’s Sam Wyche by respective scores of 15-7 and 13-2. Overall, Kharchla outscored his opponents 47-14 on his run to the title. Kharchla had a ton of fun this winter. That wasn’t always the case, though. An injury derailed his freshman campaign and his sophomore season — a year which saw him compete at 145 and 138 — didn’t feature anywhere close to the success this one did. He certainly believes it now. His coach, meanwhile, believed it all along. The Patriots, as has been the case for several years now, finished as the highest-scoring team from Central Ohio. They closed eighth overall with 52 points. Senior Trevor Lawson helped his team secure a good amount of those points, picking up second-place points at 182 after getting to his second state championship match in the last three years. Lawson, who was edged by Massillon Jackson’s Victor Marcelli 3-1 in Saturday’s final, finished third at 170 in 2017 and second at 170 in 2016. Lawson finished the season with a stellar 37-3 record. Liberty sophomore Blake Saito also earned a spot on the podium, finishing eighth at 138 to become a state placer for the second straight season. Other area state placers included Olentangy’s Jacob Sherman and Alexander Gore. Sherman finished fourth at 113, winning three straight consolation matches before falling to Brecksville-Broadview Heights’ Andrew Perelka in Saturday’s third-place match while Gore wrestled his way into the seventh-place match at 145 before falling to Huber Heights Wayne’s Austin Mullins by a slim 4-2 margin.